Job interviews in Greece can range from quite professional to downright insulting. A Kathimerini article detailed the interviewing experiences of three Greek candidates, and I can tell you that my experience as a non-Greek is the same and worse in some cases. The process has changed little over the last 10 years. Everyone at my high school received a semester of instruction on how to create a CV, search for a job, answer ads, network and customize a cover letter, in addition to phone etiquette, proper dress and interviewing techniques (mock and real). The class was a requirement for sophomore year, with the expectation that most of us would get part-time jobs to start saving for college or at least get job experience in case we weren’t continuing our university education. At the university I attended, we were again versed on proper dress, customizing CVs and cover letters, networking, how to sell ourselves and make informed choices that would permanently impact our career. No doubt it was for our benefit, but it also impacted our university in that well-known organizations came to recruit us, and we were expected to uphold its reputation by being the best candidates in the nation. None of this applies or does much good in Greece, in fact this type of styling is only now being recognized and marketed by savvy entrepreneurs as a paid service, since none of these things are taught in school. A majority of people do not have CVs, don’t know how to create one or how to dress for a job interview. Many get their jobs through relatives or friends, and there are employers who pay little attention to CVs, skills and experience or dress code. If you need help with creating a CV, please see BBC’s excellent guide “How to write a CV.” Note that a Curriculum Vitae or CV is different than a resumé from countries such as the USA. And if the Greek employer requests that you send a photo, it’s because your physical appearance is important to him and you will be judged or discriminated against as such. Getting a job interview with a good company can sometimes be more difficult in Greece since many positions are never advertised or advertised but filled with a candidate with connections. The job market is not a level playing field, but it doesn’t mean you shouldn’t do your best. Choosing what to wear to an interview depends on the job for which you’ve applied. Wearing a suit or clean cut outfit to an office, public sector or other service job interview still makes a better impression than short skirts, jeans and club wear. Some employers see people who dress too nicely (Gucci, CK, D&G) as not needing a good salary, though dressing too casually is seen as not being presentable enough to hire. It’s a fine line. Many Greeks wear black, which is frowned on by other countries but seen as “formal” here. When several dozen gather for career fairs, it looks like a cross between a funeral or club opening due to the range of skirt lengths, shoe heel heights and state of dress (leather jackets, designer jeans, khakis, hooded jackets and shorts). Don’t follow their example. It’s still inappropriate and unprofessional. This might seem like a no-brainer to most people, but I’ve seen people bring friends, cousins, boyfriends/girlfriends or their spouse. Not only is it unprofessional, but it’s also immature. If they gave you a ride or came along for moral support, don’t let them come into the establishment with you, even if they wait in the office lobby; have them wait outside the building, downstairs or in the car. It’s important to arrive early or on time, even if your interviewer is late. Map out your route in advance via public transportation or arrange an appointment with a radio taxi; plan for delays and don’t take chances on the street. Arriving early is a good idea to recover from the journey and calm down, instead of rushing in breathless. After you arrive at your destination, power down your cell phone or put it on silent mode. A potential employer may want to hire you, so it’s time to concentrate on the task at hand. It doesn’t make you look important to get calls during an interview; it makes you look unprofessional, self-important and stupid. Greet your interviewer with a smile, shake their hand and introduce yourself. Answer questions honestly, be nice and have some questions of your own to show interest in the company/position (research in advance, read the news); the latter can also be used as a way to direct attention away from personal info and back to professional questions, which is the point of the interview. Some light marketing is expected to prove you’re the best person to hire, but don’t overdo it since boasting about qualifications and personal success is considered arrogant. I have a copy of my CV and take notes in case the interviewer wishes to review something or reveals a salary figure or list of responsibilities. It’s especially handy when an employer changes the terms after hiring. Thank them for their time when you leave, no matter what. It’s up to you whether you feel comfortable answering personal questions, which will almost certainly be asked and is not considered politically incorrect or invasive. My only advice is to not lie because you’ll be caught later on if you’re hired. Be aware that being overly friendly may not get you into an employer’s good graces and work against you, but shutting down is not acceptable either. Err on the side of cordial politeness with short answers. Things that don’t happen in other countries will happen here. An interviewer may smoke, crack off-color jokes (racist, $exual, anti-something), say outright that your Greek language skills are horrible, or offer you food or a shot of whiskey. Politely laugh at jokes and cringe later in private, never mind if someone smokes but don’t yourself, don’t be shaken by insults or an employer hitting on you, and go with your gut instinct. In most developed countries, a job candidate or employee is seen as less intelligent if he/she talks about, holds or drinks an alcoholic beverage while on an interview or business lunch, but in Greece this is sometimes not the case. Following up with a letter or phone call isn’t done here, and likewise no one will contact you unless a job offer is being made. If they invite you back to complete tests or a second, third or fourth interview, you must decide if you really want the job enough to endure or instead spend your time looking for something better, as it could go on for months with no result. Be nice to everyone on the phone and in person. The person who calls you for an interview or greets you at the front desk may eventually be a co-worker, and you never know the level of influence they have. My boss always asked my opinion about who I liked and why before hiring anyone, even though I was not his secretary or part of HR. Call to cancel your interview if you don’t plan to show up. I realize that many don’t, however if you want to one day apply at that same company, be aware that some people keep notes under your name and will not invite you back based on past behavior. Now take a look at the Kathimerini article. Most job-seekers are 30 years old or older, educated and earning about 700 euros a month, often with degrees from Greek or foreign universities. Job interviews are a two-way street and job candidates get a good idea of the firm and its corporate image from the person interviewing him or her. Most agree that a good interviewer doesn’t talk much but listens carefully. 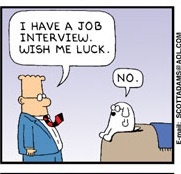 A poor interviewer nearly always seems bored or else talks too much. When he starts talking about himself, it is usually because he is interviewing an attractive woman. “Our parents’ generation has forgotten what it’s like to be an outsider. We want a starting chance,” said Dionysia, 27, a graduate in public relations who has gone on about 10 job interviews. Dimitris, 28, said companies basically want someone who will work until 9 p.m. for 500 euros a month, who doesn’t care about money but just wants to learn the work. Having completed postgraduate studies, he is looking for a job in human resources, and so far has been to eight interviews. Antonis, 31, was once asked by an interviewer if he was an “opportunist,” and if he was, then he wasn’t wanted. He is already working in the field for which he was trained, economics, but is trying to get a better position. Since the beginning of his career, he has been to 30 interviews. When i finished my service in the army, I passed a “superb” period of reading ads and going to interviews that fell in the range of this article. Once when I showed enough nerve to ask what salary would I earn, a smartass said to me, “The more you work, the more you get paid”…..
That is the thing with Greek employers. They wants you to work 12h a day and get paid 700 without a raise for 2 years minimum. And if you ask for a raise they say that they can hire the next unemployed educated young man. So we end up as the only country in Europe where the public sector pays more than the private. Wonderful article–you always do your homework Kat! I wonder what the long term consequences are of underpaying qualified persons and hiring folks based on nepotism etc. One could say the consequences are having an incompetent country or infrastructure like Greece? But, I’m not sure if this sounds harsh. S – I hear you. I asked for a raise after one year, not just because it’s supposed to happen but because I was promised one, and I was told that I didn’t deserve it. When I presented stats (hmm, maybe I should work for NSS as you said) on how I produced 40 percent of all profits of 10 people, he said “I don’t want to hear your excuses and bull$hit.” Oh, OK then. I’ll just work a lot less. Turns out he gave me a 2 percent raise on paper as required for IKA, but I never received anything more in my pocket. He did a lot of things like that, including not giving me the vacation time I was owed for the first 2 years, which is the reason I ended up filing a claim at the epitheorisi. Speaking of the public sector, Greece has the highest expenditure and lowest productivity. The S – Sometimes the truth is harsh. People here don’t realize higher salaries, less corruption and accountability are necessary to attract businesses and get the best workers to move the economy upward. The UK isn’t perfect, but they’ve got a migrant programme to attract educated, skilled professionals because they realize they’re losing a lot of people to the USA. Well, most of the EU is losing people to the USA, which is the reason the “blue card” program is being started. However, I doubt the blue card will make it to Greece; look how long it takes to implement everything else. Kat, found this site and it is SOOO TRUE. I am living and have lived in Mykonos for the last 8 years, although I have managed to make it and do well, but YES Everything you say is CORRECT. Thanks for reminding me that there are others out there like myself. After changing almost 15 jobs until I was 28 years old and been through numerous interviews the way you describe, I managed to finish my third school (Pedagogic Department of the University) and work as a school teacher since last year. My relief is great! But even though I’m Greek, I still want to move out of Greece looking for a better life moving west or teaching in Australia. Life in Greece is hard in the many ways mentioned in your website. While I was living in Greece I had never needed to create a CV and for the only job in an office that I had while I was in Athens, I didn;t need really to go through an interview because the hiring manager was my brother, who by the way had also hired his at that time girlfriend and a year later wife. K – Thank you for checking in and for your affirmation. I know so few of us single Americans who made it on our own without marriage being involved, and I’m really happy for you! B – Hi there and welcome! My goodness, 15 jobs before you were 28! I don’t have the luxury of being selective, both because I’m an immigrant and the industry I work in, but I can totally understand why someone would change so often (seriously). You should be proud of yourself for taking control of your life and getting to a better position. If you want to go abroad, I believe your obvious perseverance would be a great asset to getting there and being successful. I hope you stop in again and tell us your progress. S – You’re so right on both points. My fiance doesn’t have a CV and has gotten all of his jobs through connections, although he did need to interview for some of them as the job wasn’t automatically his, and he had to prove himself once on the job. And yes, I do know people who struggled and complained about cronyism, but then became the same way after becoming a manager — hiring people he knew, abusing his power. Ironic, isn’t it? Yes, edo Ellada, but how is anything going to change if panta einai etsi? I’m English but have lived in Greece for 2 years now. I went for an interview, where they advertised for a native English speaker, and before the interview I made it clear that my Greek, whilst good for the time I’m here, is by no means fluent. They told me to come to the interview, as it was native English speakers that they needed. At the interview the lady only spoke Greek, to which I gladly responded and made my best effort. I politely told her in Greek that the job had been advertised for native English speakers, and as the interview progressed I would find it more easy to speak English. She refused, telling me that I had to speak Greek for this job! I was a little bit confused, so I tried with my Greek, but she told me it was not good enough. I left, seriously confused, why advertise for native English speakers, don’t make any stipulations for Greek in the advertisement, or even when the candidate before the interview makes their level of Greek known, and then demand that they only speak Greek at the interview!?! Her only answer was, ‘I know that you speak English’. Well it was a good Greek lesson anyway, and honestly I love to speak greek, but when you go for a job interview wanting native English speakers, it was not what I expected! Your story reminds me of my final interview at the U.S. embassy, as told in “Jobs at the American Embassy in Athens.” You’re not alone!